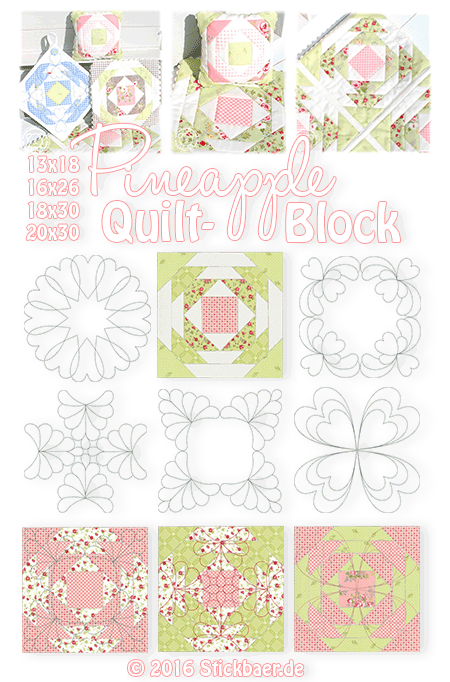 Sure you’ve already read one or the other post about my own Pineapple Quilt blocks, like this one: here. 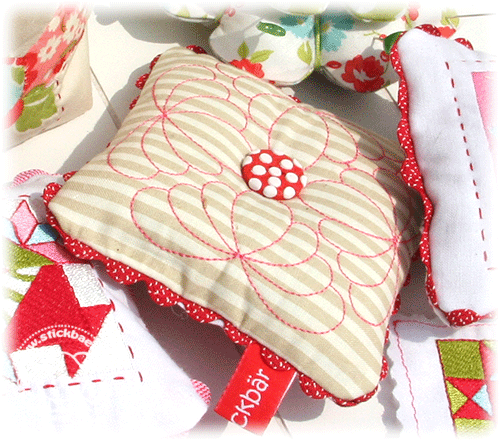 I sewed (embroidered) 4 identical blocks and joined them with the Quilt-As-You-Go method (QAYG). When you don’t know this method, there are a lot of video tutorials at Youtube. 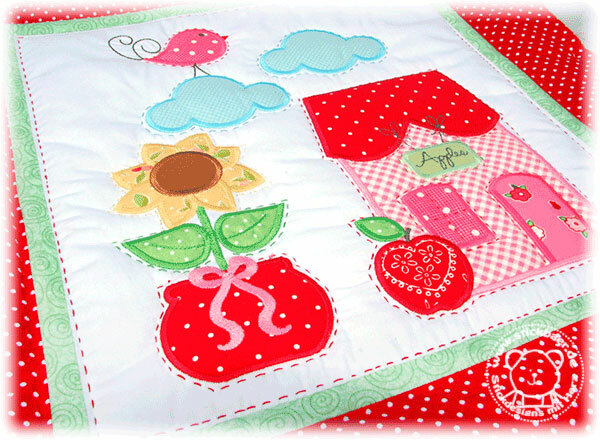 And all of you who own my Little Village Quilt BOM and together with the last block got the sewing instruction, you have a detailled picture instruction about the QAYG by me. This is how it looks when the blocks are put together. 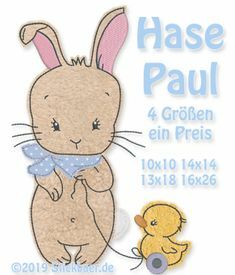 This is a really complete embroidery file. 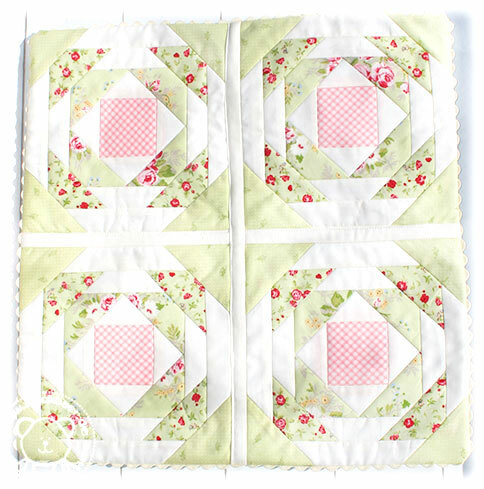 We have a base block in 4 hoop sizes, 5 different quilt motives that look great on the also on other patchwork blocks, and 5 quilted Pineapple blocks. For each size, 11 files. And as usual we created some bundles for you. 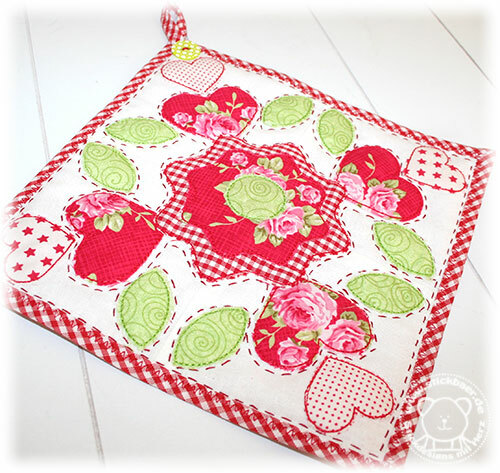 This pot holder from the 16x26cm file has the right size. 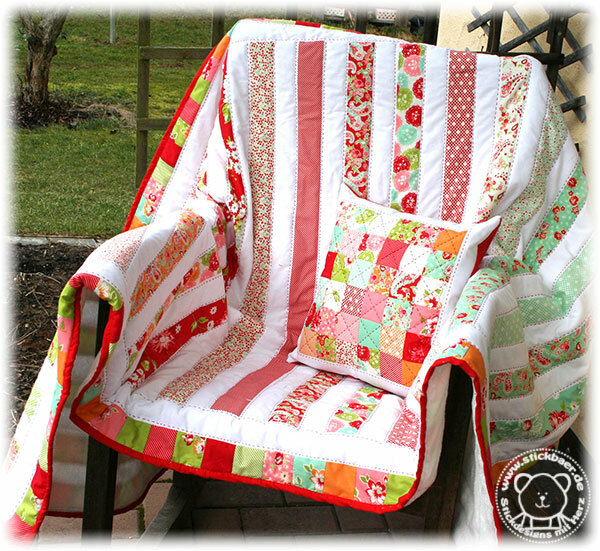 This blanket from 4 blocks was done from the 20x30cm file. 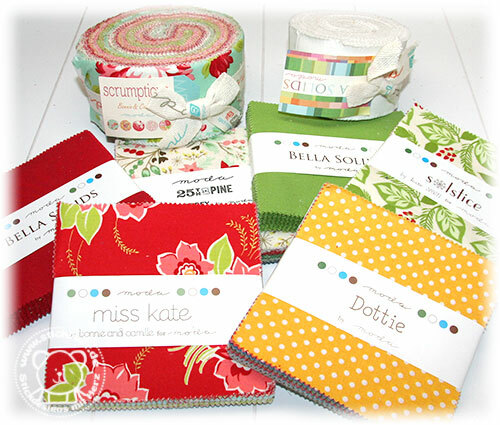 The beautiful fabrics are taken from the Mode collection “Windermere” and are available here in Stoffekontor. 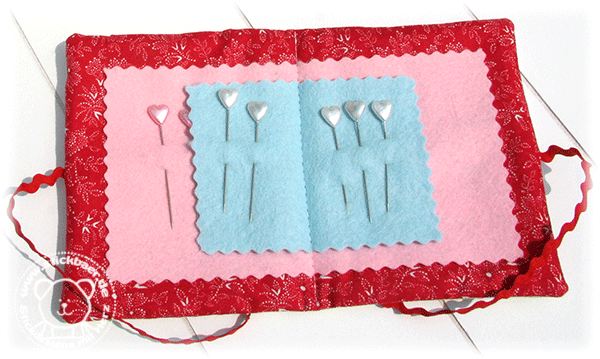 This is a really manifold embroidery file. 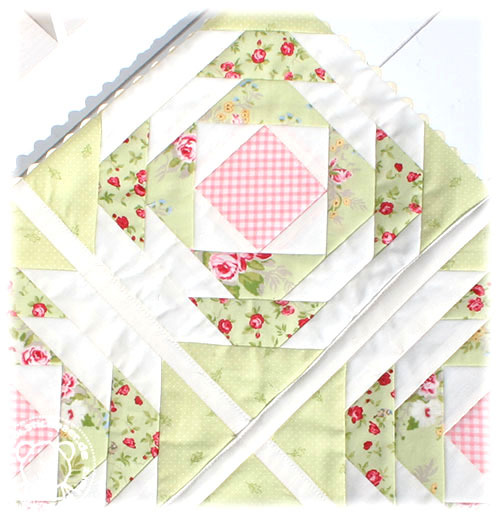 You can sew whole quilts from the 6 ready blocks and the 5 quilt motives. Or you realize smaller projects that will not take too much time. 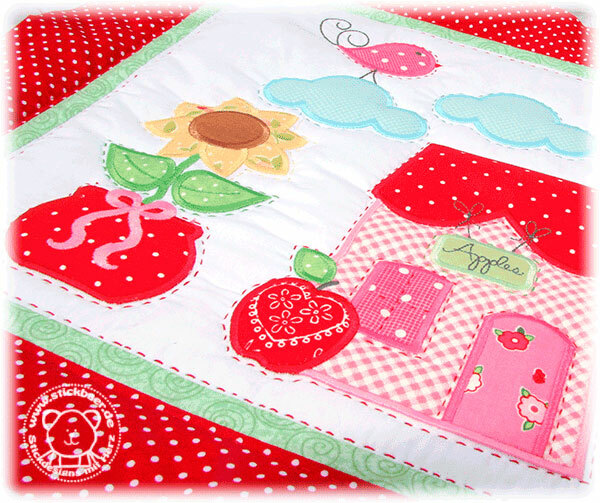 And you can mix the file with our other quilt files, like Quilt Dreams or Quilt Dreams 2. 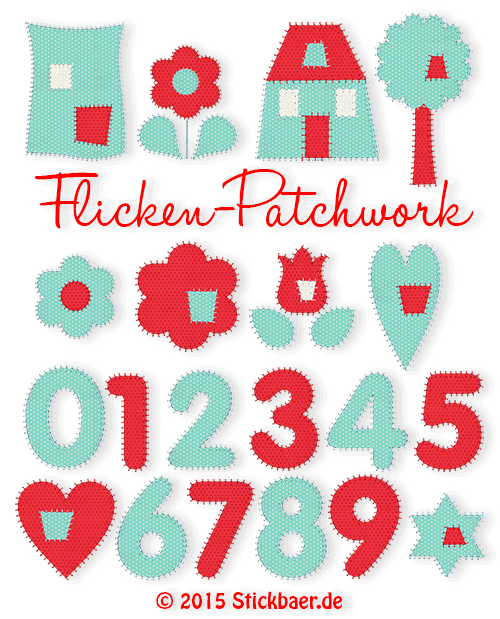 Do you like our latest Patchwork embroidery file? You can get it from today in our Stickbaer Shop. Maybe you use the Pentecost weeked for a new project? Isn’t it amazing? Where is the time gone? 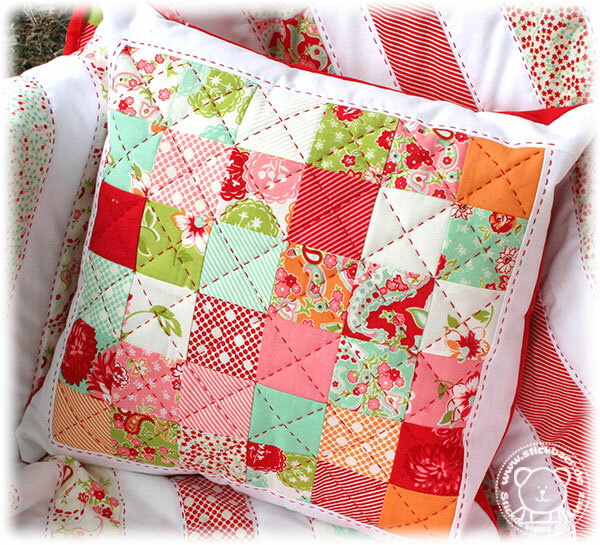 I remember as it was yesterday when I told you about my idea of a One-Year quilt project. And now nearly one year is over and here is BOM 11 for May. And this the block looks like summer. The birdy is the captain, look at his captain’s hat. At the beach house you can get icecream, 50 cent the ball. 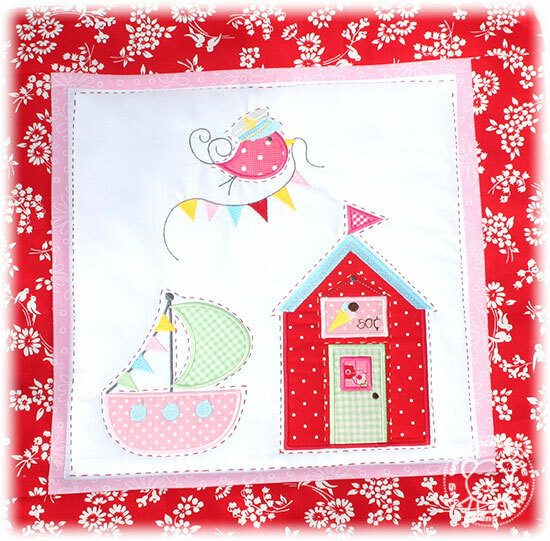 And the boat has sail and bunting. 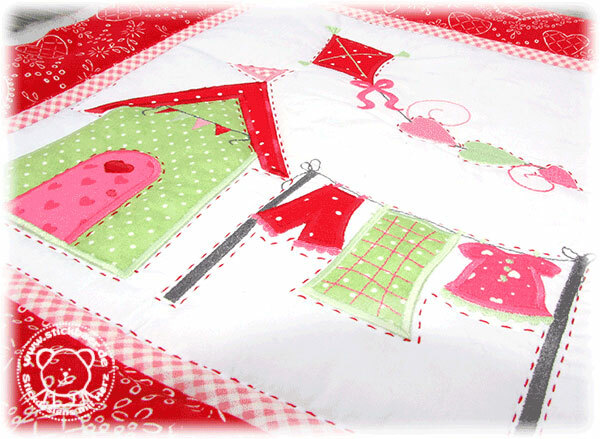 Look, how far we already are with our quilt. 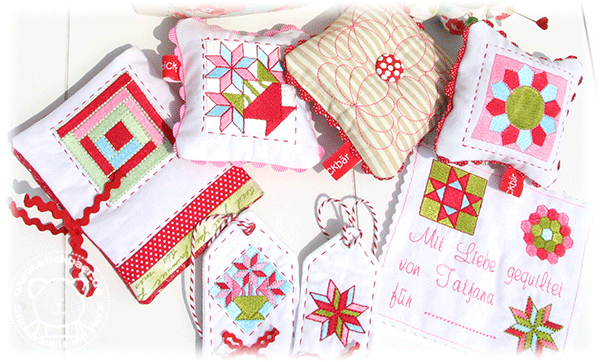 I already started to sew together my blocks. 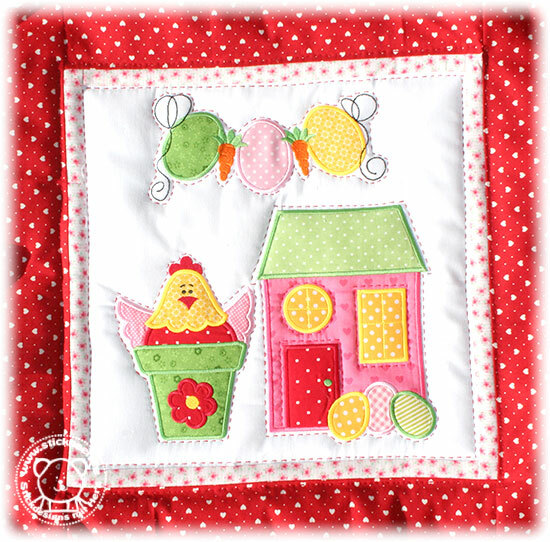 Next month, together with the June embroidery files, you will get the instruction on how to put all pieces together following the Quilt as you go-method. 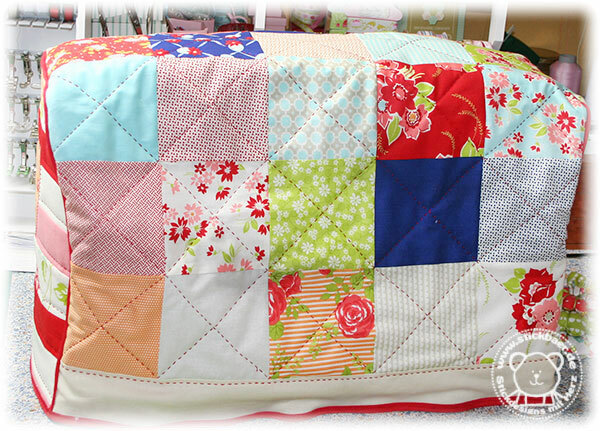 As you can see, our quilt is getting wonderful. 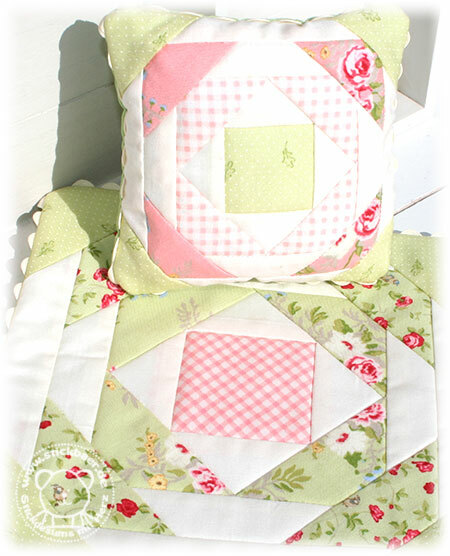 But now, first do the 11th block and put it to the other already embroidered and sewed blocks. This is an impressing stack! 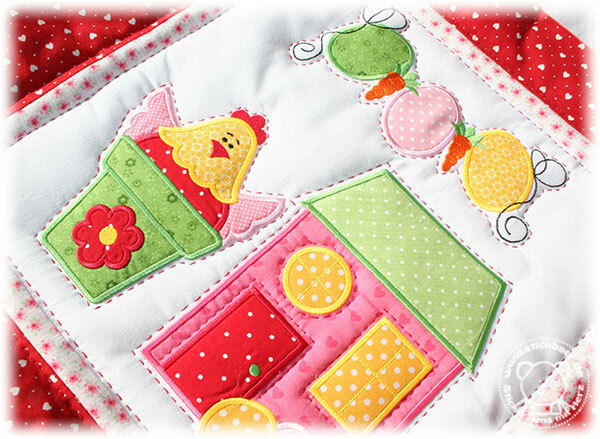 Some time ago we presented you our Patchwork-Minis and our Patchwork-Alphabet. 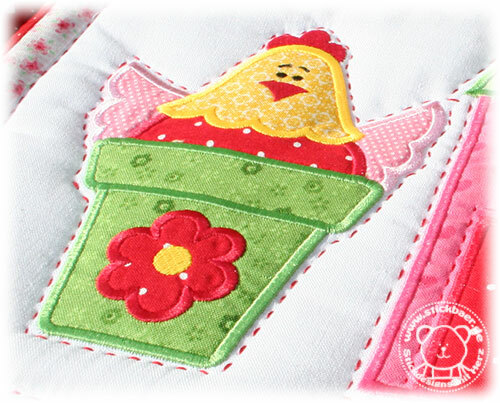 You liked the edges around the cute motifs very much and asked if we could not offer more embroidery of this style. 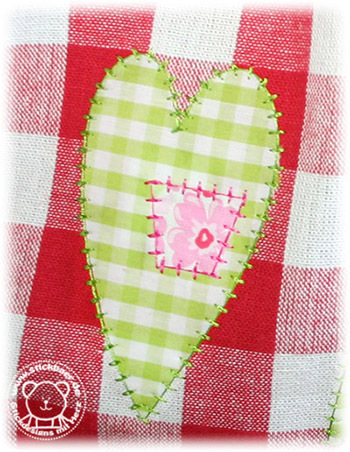 To not let the fabrics edges show underneath our special applique stitches we want to show you how to do this. 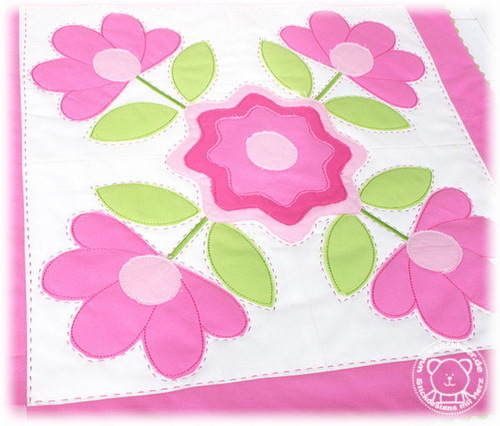 It is a little bit different from the already known Way of Applique. 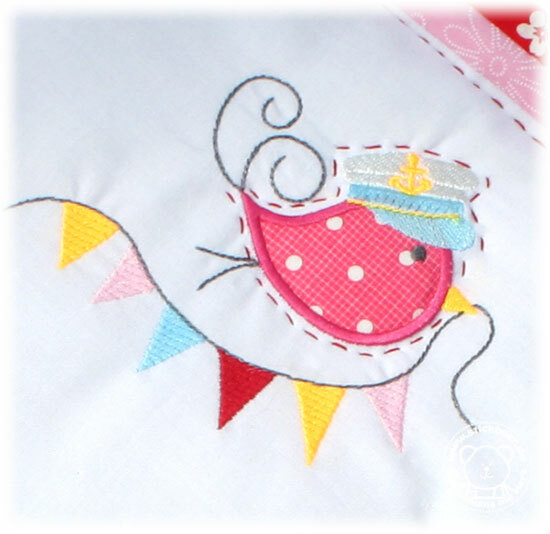 The ZIP download files contain for each embroidery motif a PDF file with the applique template. 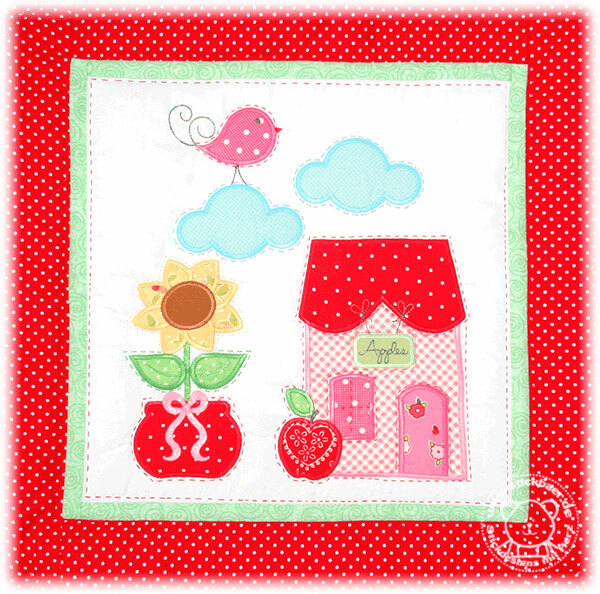 As an alternative you can use this for applique with the sewing machine. Print it out, remember to check your printers setting for “no scaling” or “100% scaling” or so. 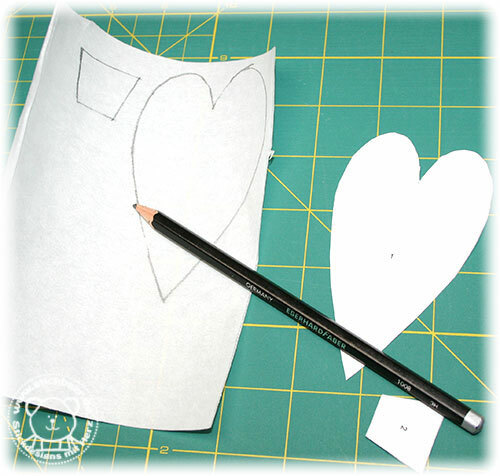 Put the cut-out, mirror-inverted paper motif onto Vliesofix or Steam a seam. … and cut precisely at the line. 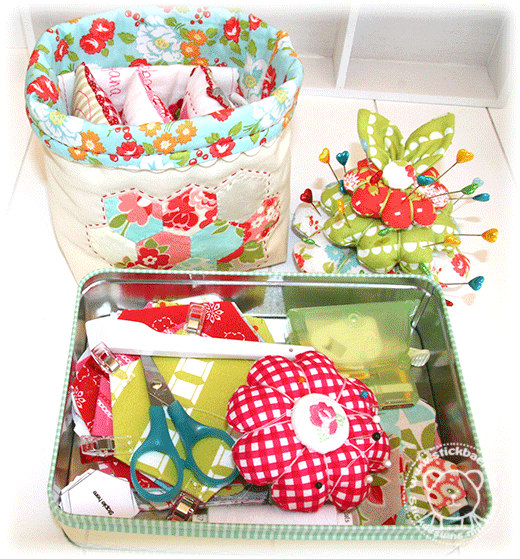 Do the same with all fabric pieces you need. Now start embroidery. First the placing line. 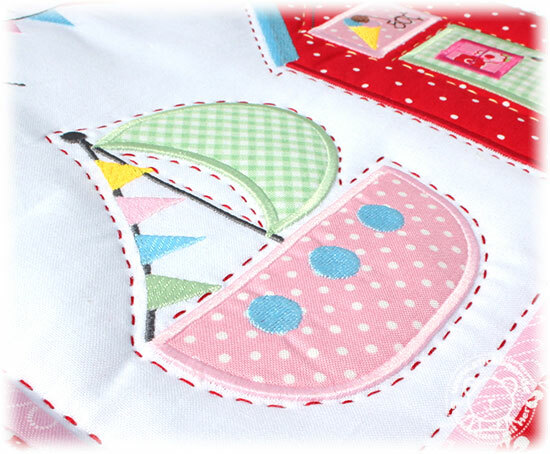 Now you would usually place the fabric and stitch it with the next stitching sequence. 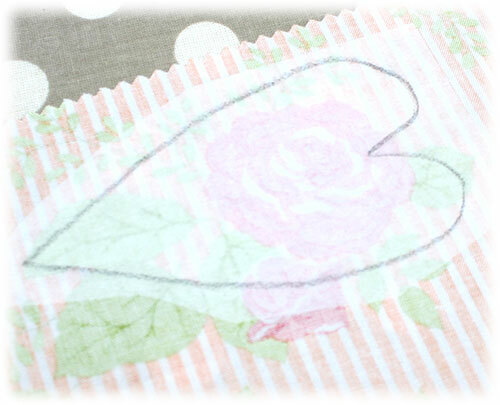 Instead, you now place the already prepared fabric patch into the marker line. 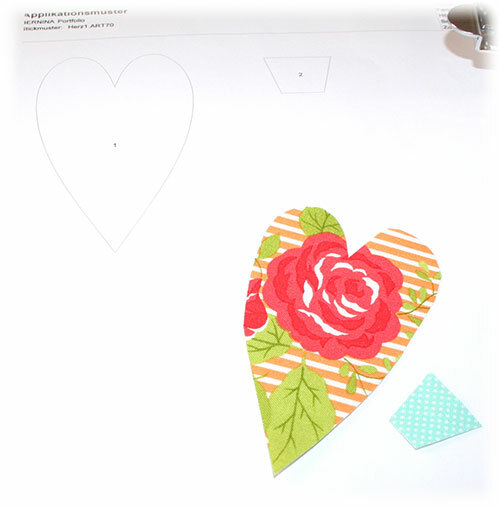 Iron the applique patch onto you base layer. 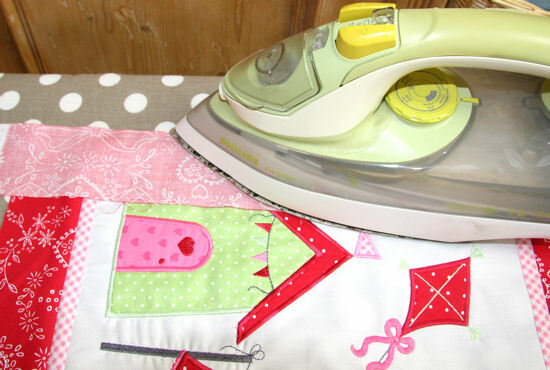 Use a mini or travel iron. 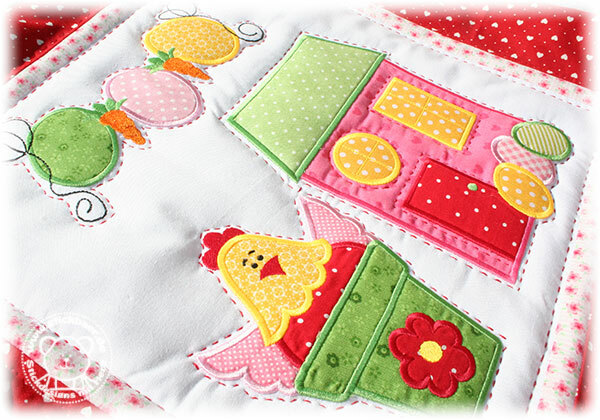 The last applique step now adds the nostalgic step we want to have in this project. Proceed with the other motifs the same way. 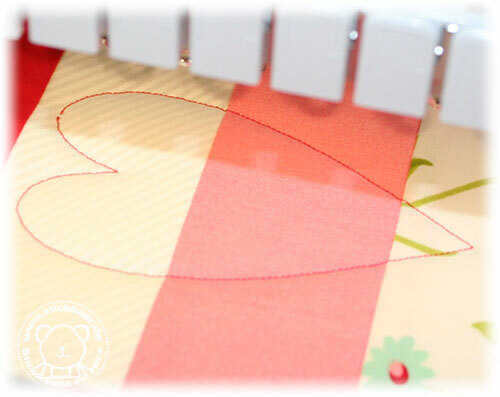 What you get is a clean perfect applique, like this on my new machine cover. So when my Bernina now has a longer rest it is safe of dust. For rolling cutter and ruler. 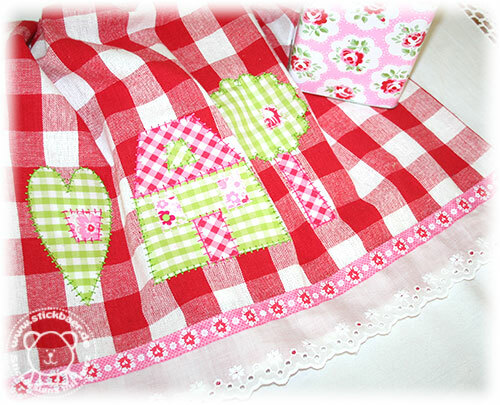 Do you like our nostalgic appliques? 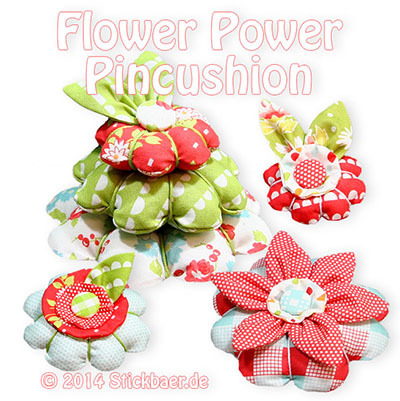 You can get them from today on in our Stickbaer Shop. 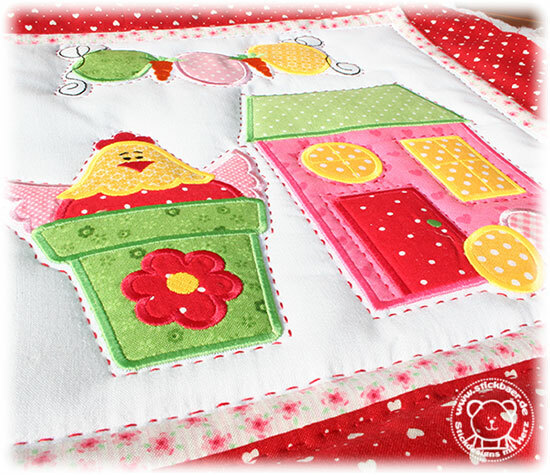 There we have the Patchy Appliques and the Patchy Applique Letters. Please enjoy this 1st of May day and a have a nice weekend. 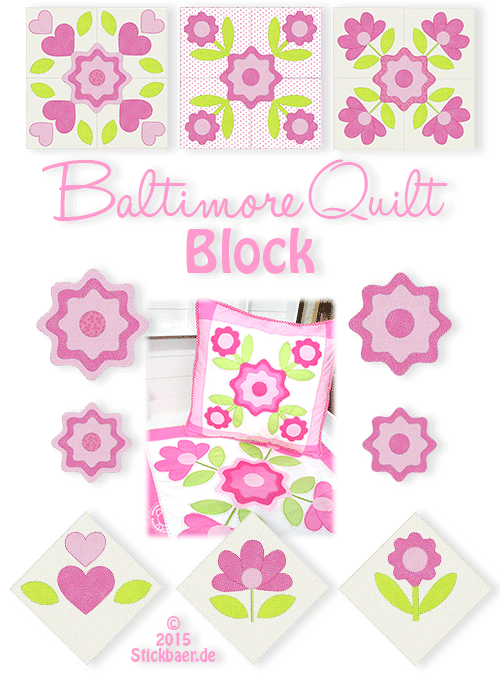 When you are a patchworker you of course know what Baltimore Quilt is. 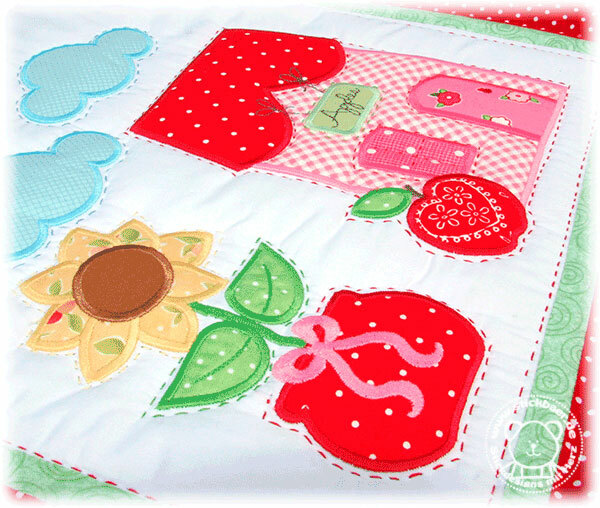 This special kind of quilt motifs usualy is appliqued by hand. 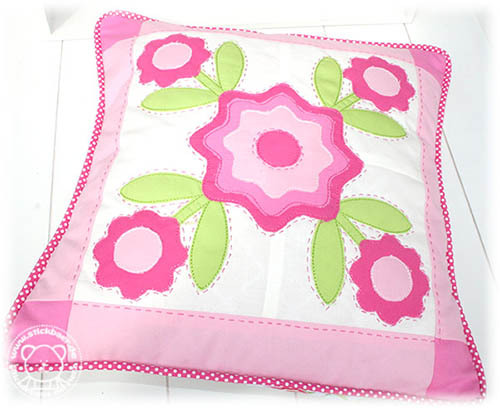 The motifs are symmetrical and you get floral blocks. 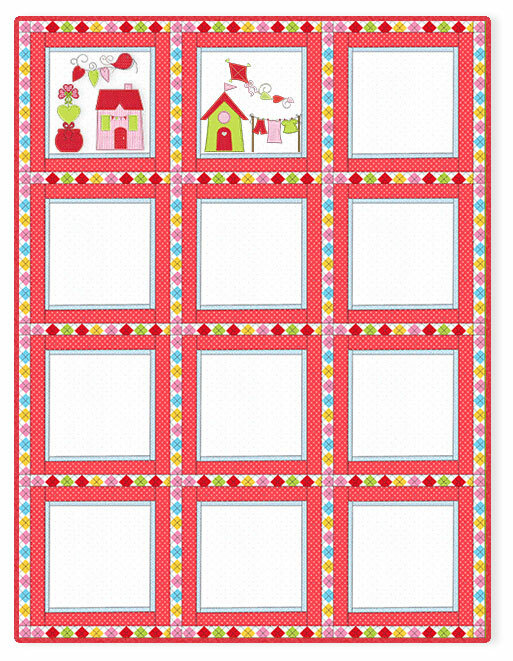 These blocks can be combined together with other quilt blocks, maybe Log Cabin or Nine Patch. 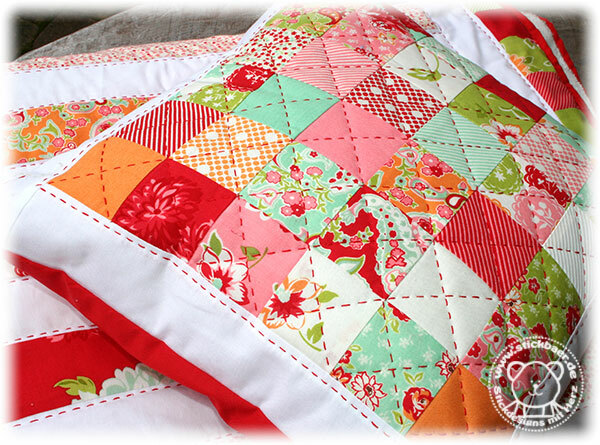 BTW, my first sewed quilt was a Baltimore. Reality is, not all of us are exceptionally gifted patch workers. So what to do? 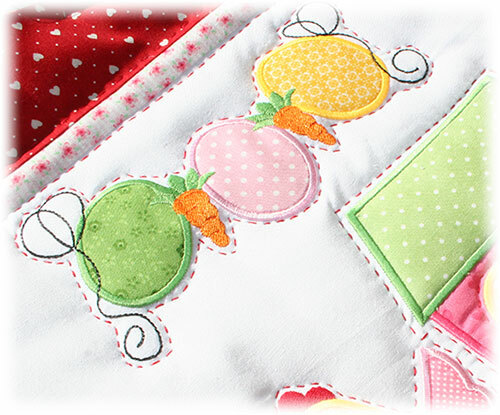 Use your embroidery machine to get to a Baltimore block. 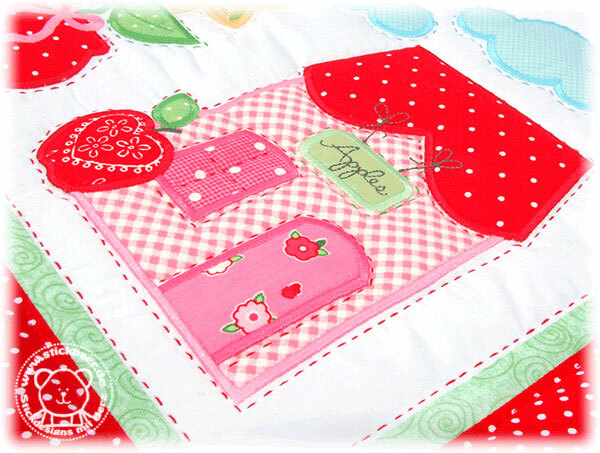 From these blocks you then can sew pillow cases, blankets or even larger quilts. 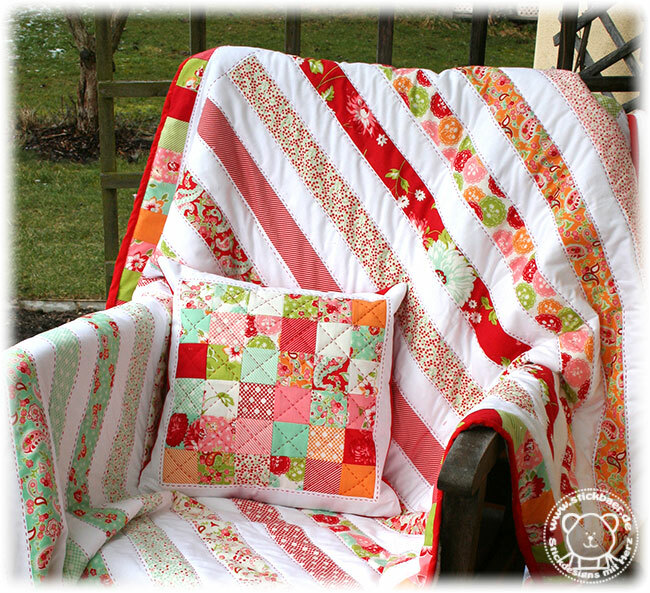 But there is no need to add other blocks, simply add some stripes around and you have created something beautiful. 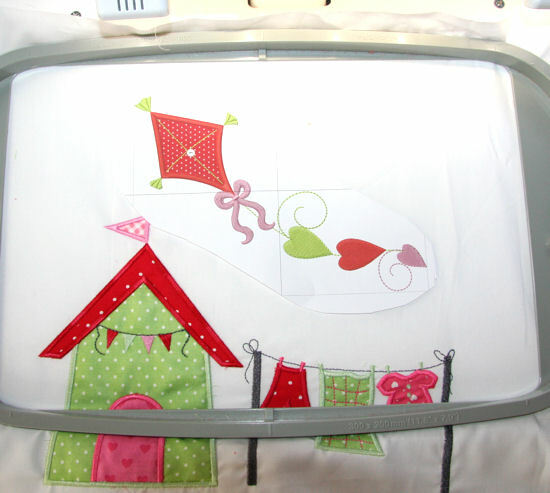 Go and make use of your embroidery machine. It is there to carrie the work and let you focus on creativity. 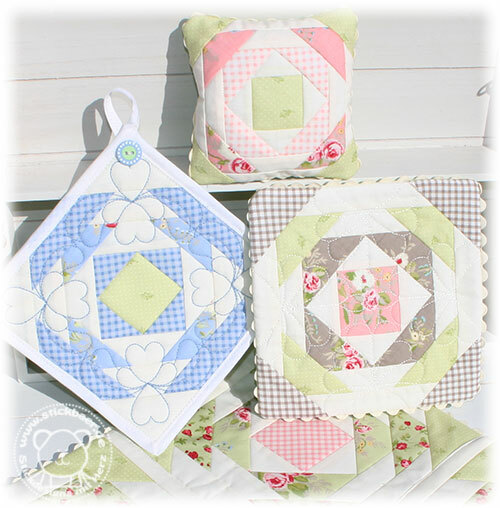 With no hand work, only using your embroidery machine you can make quilt blocks based on our latest embroidery collection. You can chose from 5 hoop sizes. 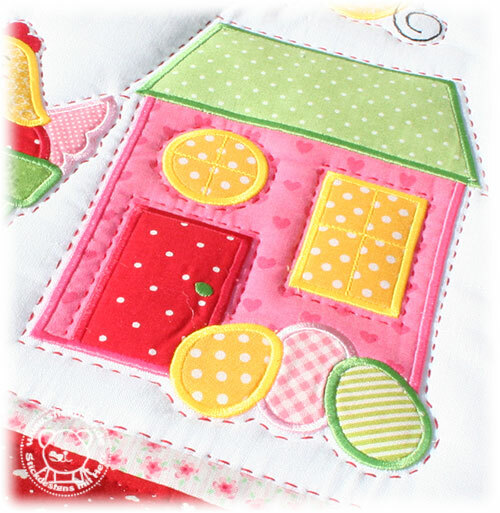 From 10x10cm up to 20x30cm we are covering a wide range. Each file has 3 different corner blocks and 2 centre motifs. This opens tons of possible combinations. 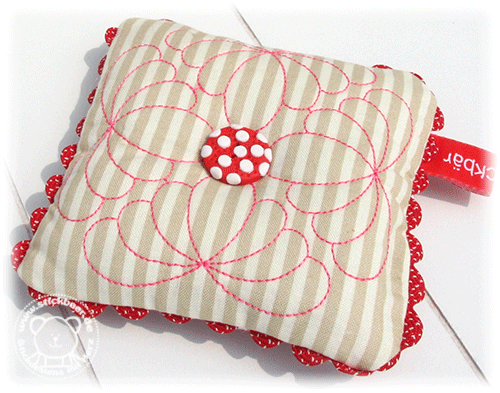 This pillow I did from the 13x18cm file. 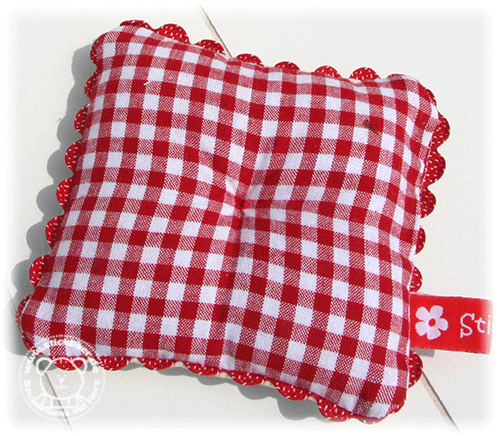 The pillow has a size of 35x35cm. Yes, done with the 13x18cm or 14x14cm hoop! 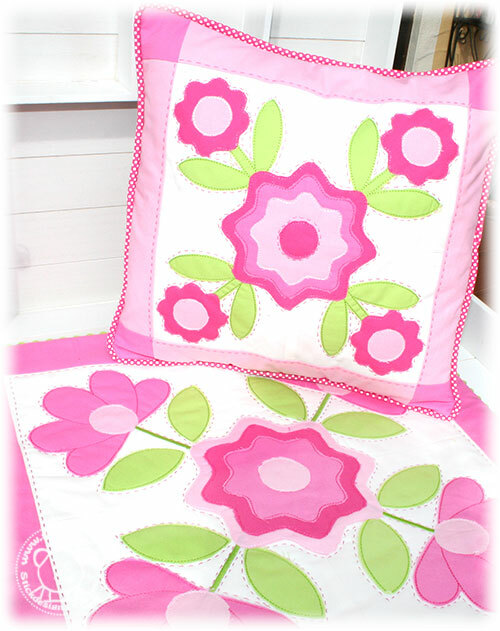 As a match I did this blanket using the files from the 20x30cm hoop size. The active space is 20x20cm. The final size here is 46x46cm. 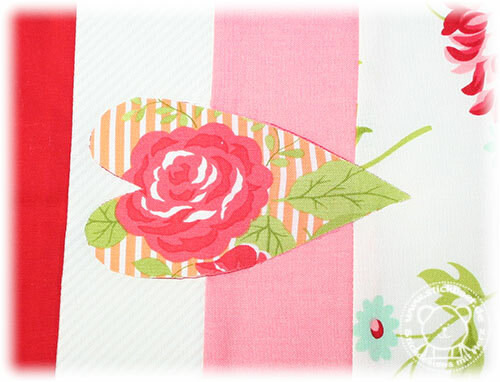 By changing the size of the stripes or by adding more stripes you can vary the final size. 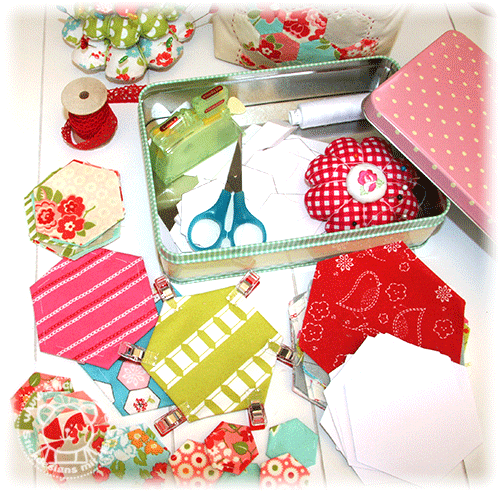 But you are right: What could I create from the 10x10cm file? 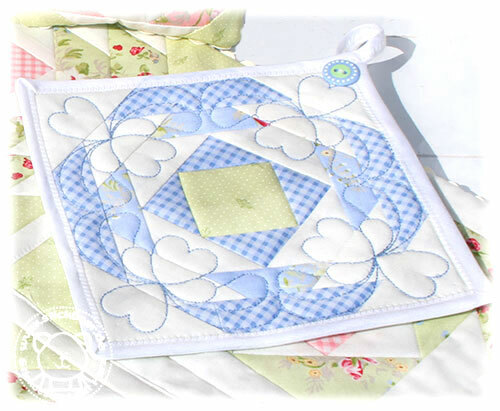 This pot holder is when ready 21x21cm! 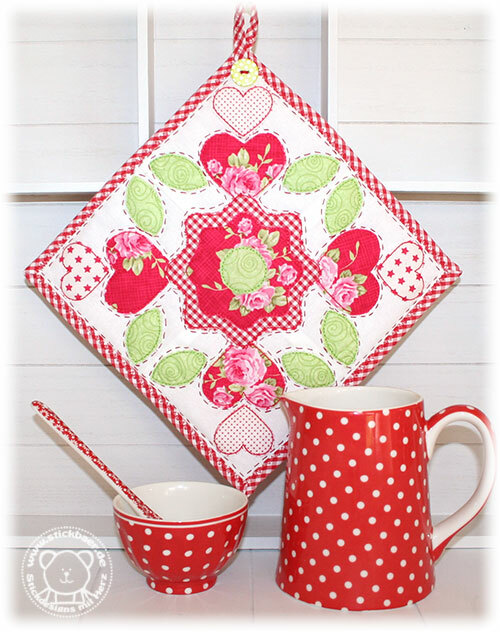 The pot holder perfectly matches the red pottery with white dots in my kitchen. 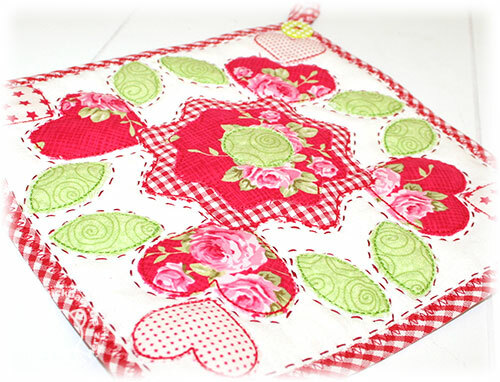 BTW, for the pot holder it took me 1 hour nearly. You see, not to much. 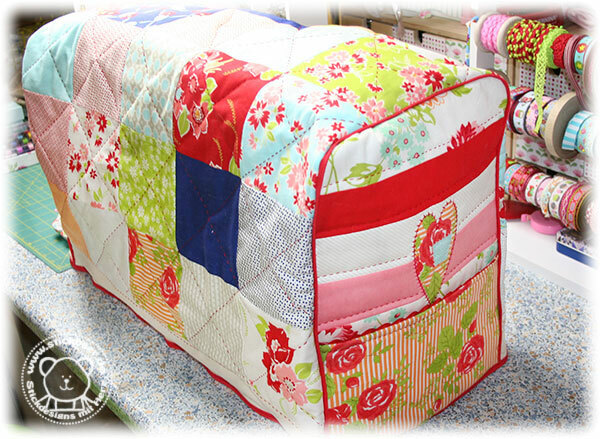 And, you are right, at the end I did some quilting. Of course I have prepared a very detailled instruction for you, with many pictures. 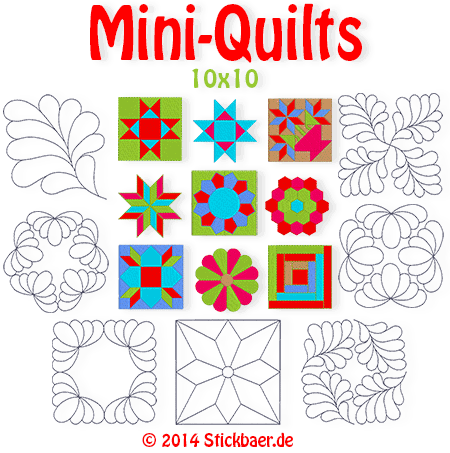 This should allow beginners to create their first quilt block. And now the turn is on you. 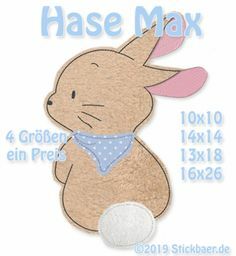 We have released the collection in 5 different hoop sizes and many sets for you today in our Stichbaer Shop. Sure you are already waiting for the March Block, especially since the month is already 12 days old. So here it comes, the 9th Block of the Month. Of course the motifs are for Easter decoration. … and even the sky is full of … eggs? 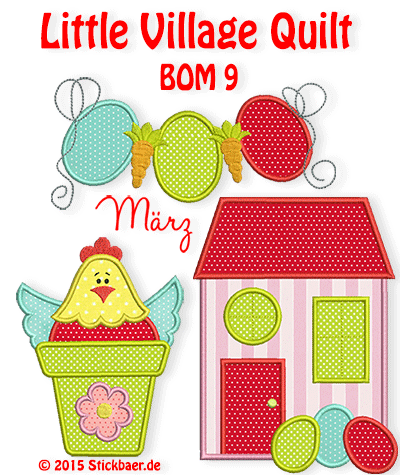 All together makes up a really easter like BOM 9, the March block. 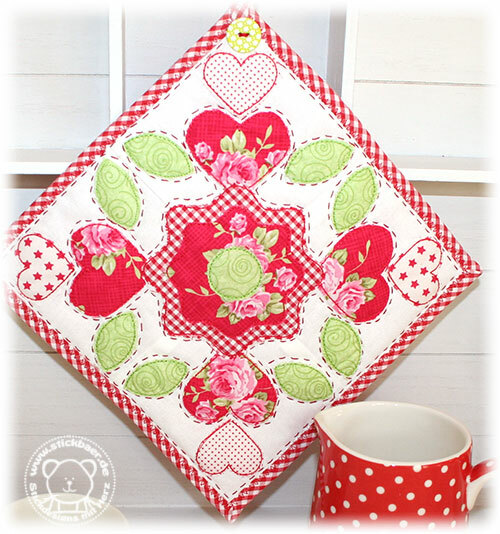 I did a little quilting around my motifs and used the Sashiko. 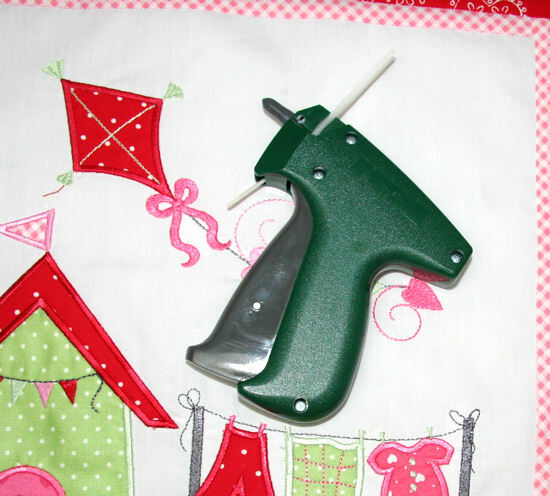 Using quilt thread, a tiny quilt needle and small stitches will do the job as well. So look, 3/4 are already done. Time for me to start the detailled instrution on how to put all blocks together. That instruction will be part of the BOM 12. From today you can get the BOM 9 files and of course the other BOM files in our Stickbaer Shop. 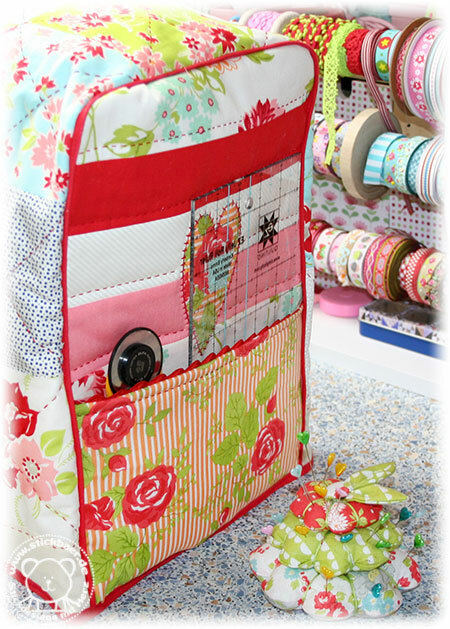 Now it is the time to show you what I did the last weeks in my little sewing room. 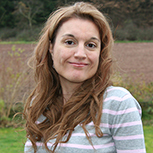 Since my work was about the birthday gift for my mam, and she is reading this blog, I couldn’t unhide this earlier. So enjoy the pics (and I am saving the words). 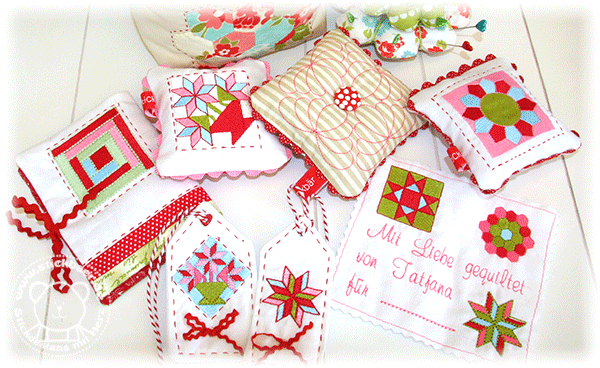 These MODA-Precuts I found during my last V7 workshop in Stoffekontor Leipzig last november. I loved them so much that I could move them over to my home in Bavaria. 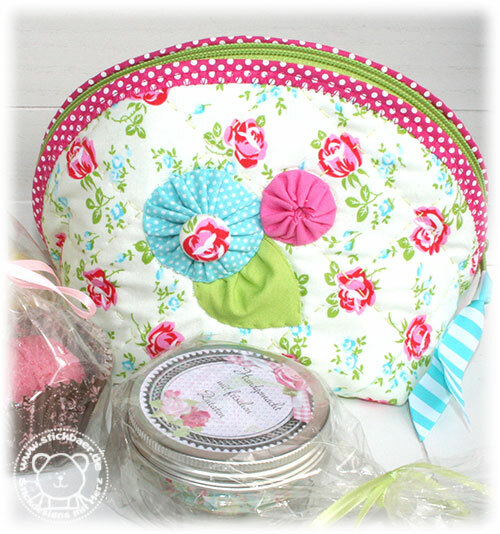 Especially the Jelly Rolls I wanted to use for something special. Not to cut them but use the full length of them. 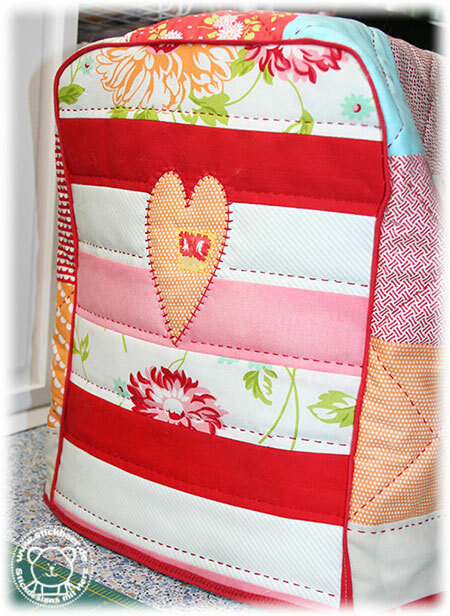 Sure, a striped quilt. 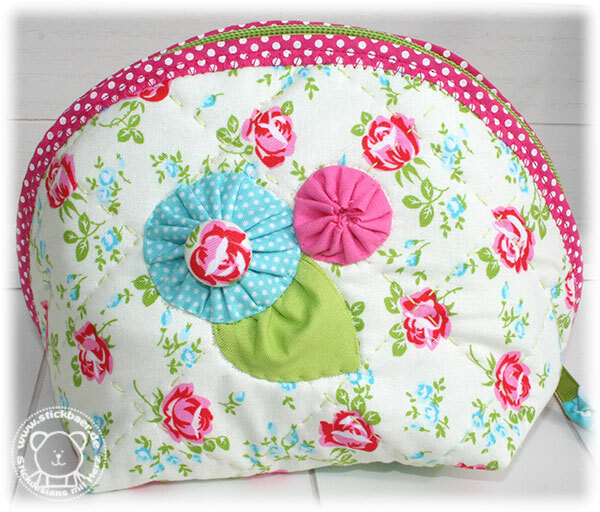 From the remnants I made a pillow top. 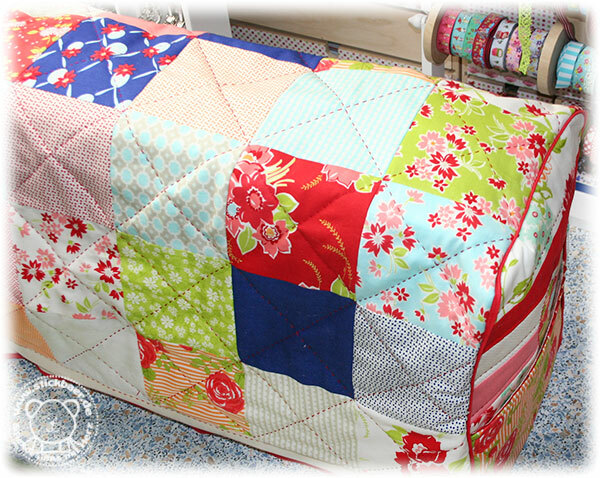 Of course all has been quilted with the Sashiko. 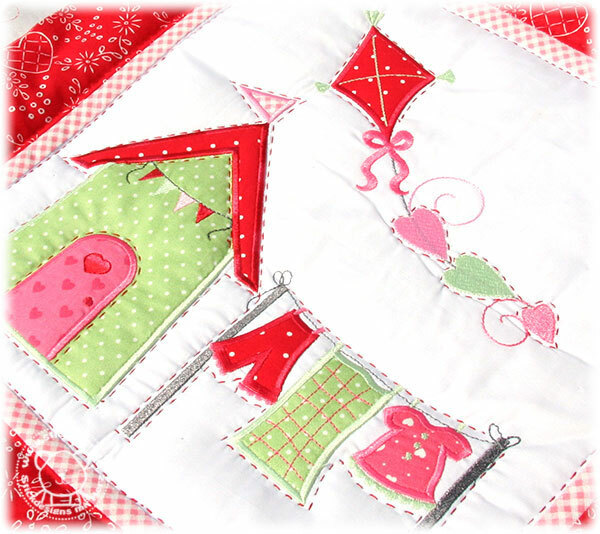 With my favourite quilt thread color, red. 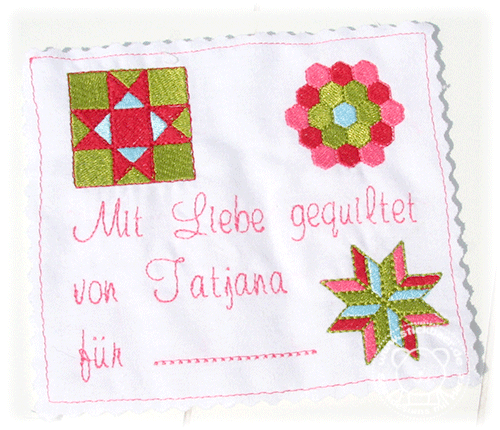 The backside is a cuddly fabric from “Dänisches Bettenlager”, a German textile shop. 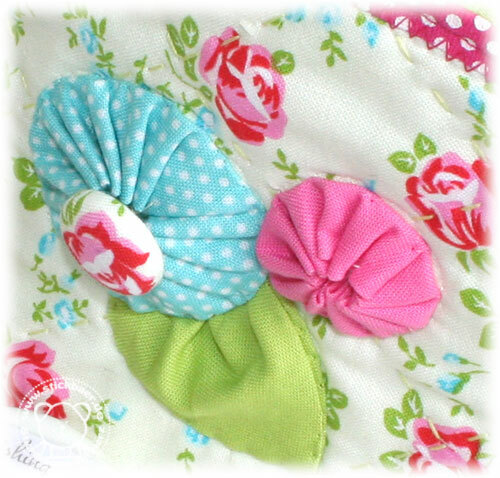 A fabric from better quality, it should last a while. It took me to the last minute, but I made it to the birthday of my mom. And she was so happy. 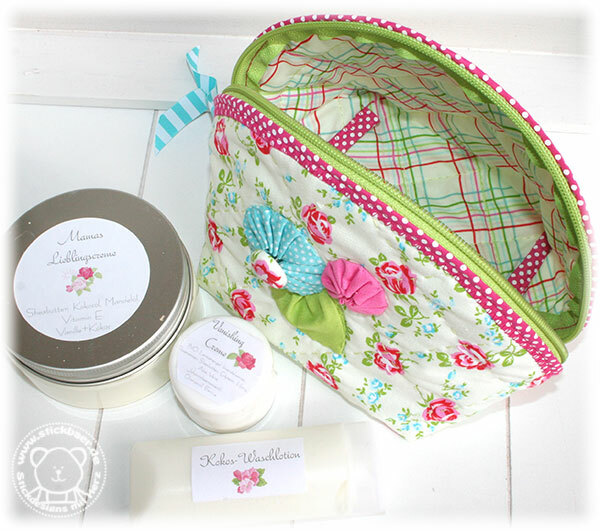 And I made a new cosmetics bag for her. She likes my DIY cosmetics. I found the instruction on Pinterest and thought that I have to try this. Do you remeber my DIY-Tutorial about the YoYos? We have beautiful sun today. Maybe we get the bike from the winter garage and try it??? 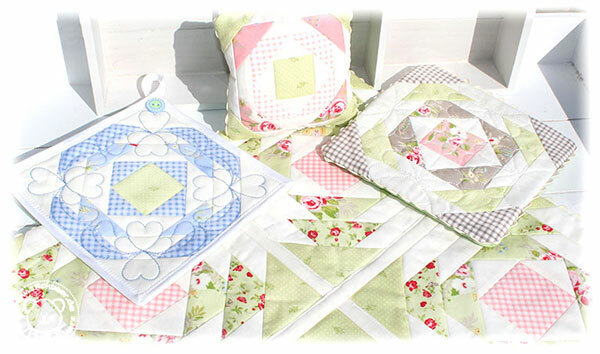 Did you already finish your first two Quilt blocks? 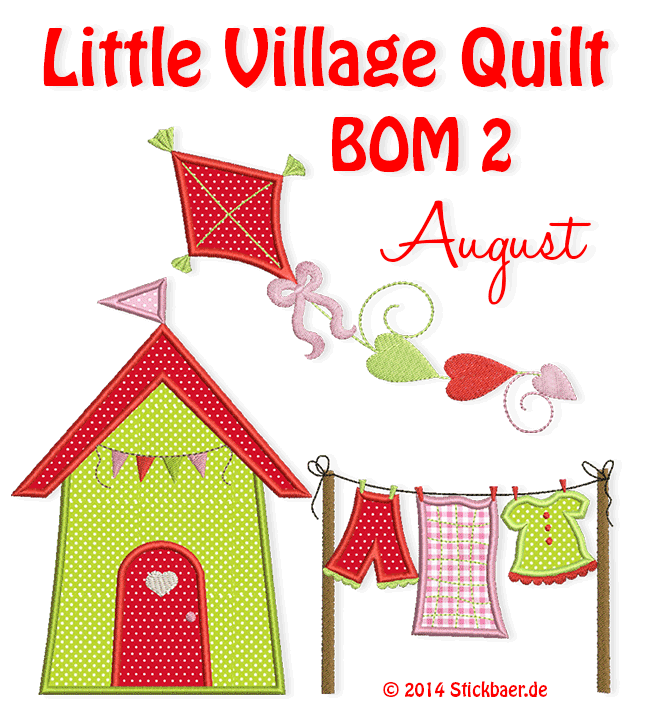 Now it is September so it is time for the next block of our Quilt Project. 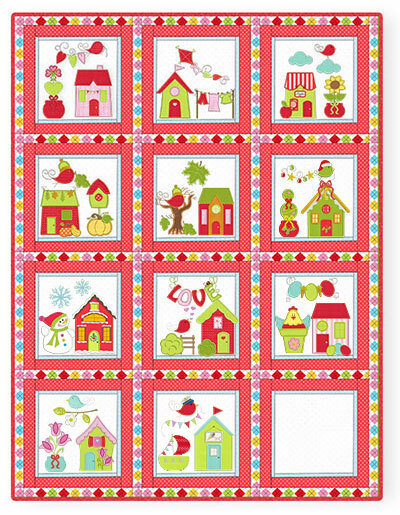 Of course the September block looks like autumn, with a shining sun flower and a red apple in front of a house. 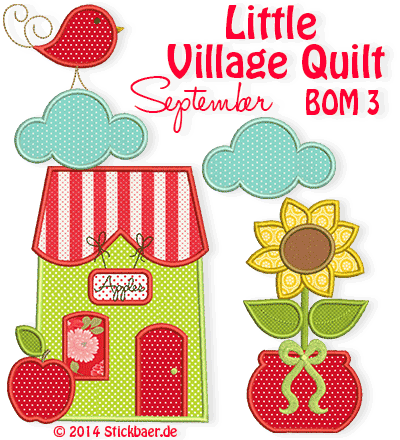 In the September BOM you can find 4 different applique files. 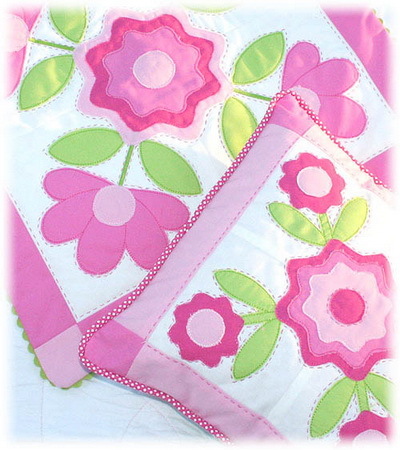 Embroider them onto one piece of fabric and you get a nice quilt block. 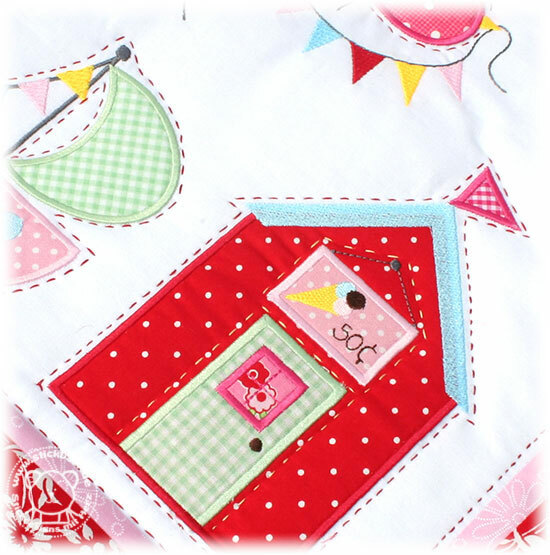 You will meet the little bird from block 1 as well as the flower pot. This now has a sun flower. The bird now is waiting on a cloud. The plate at the house says that apples are sold. 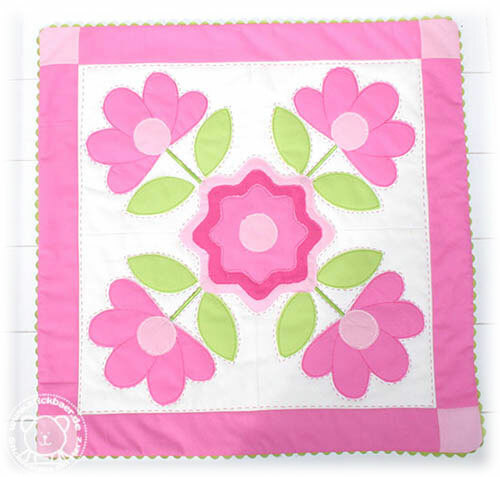 I did some quilting around the motifs so it looks more plastic. 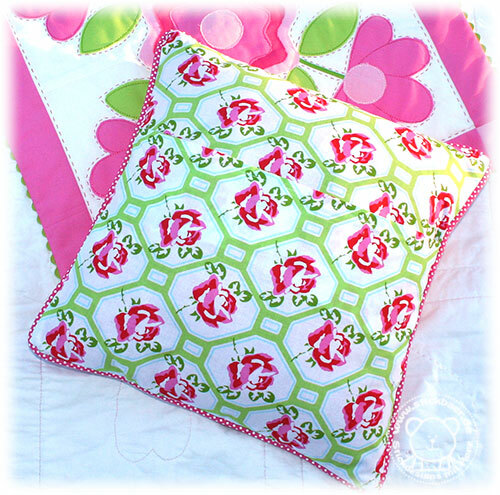 And since I used a thicker batting the motifs are raised above the white background fabric. 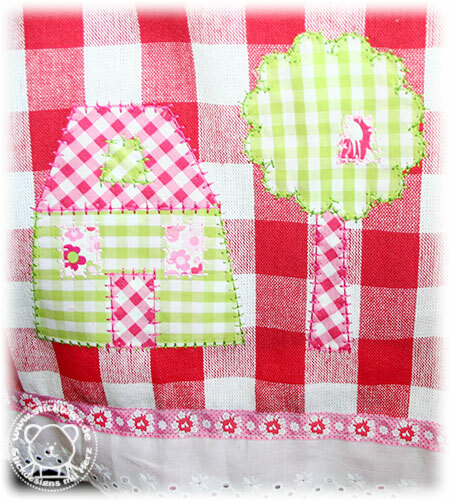 I used fabric I already used in Block 1 und Block 2. 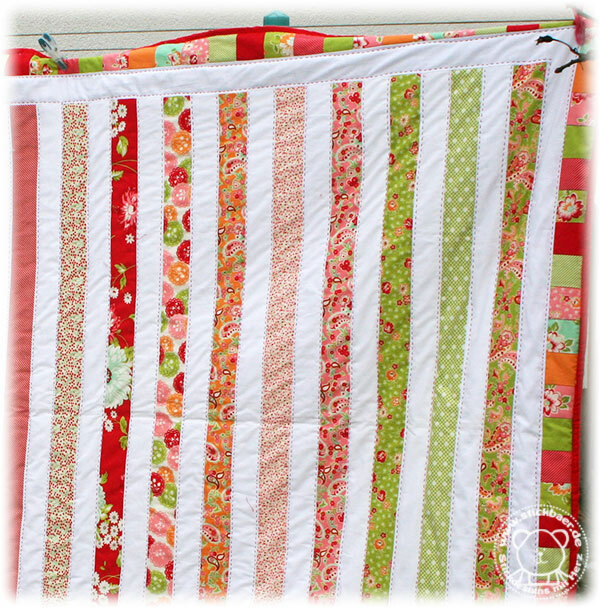 Try to use not to many different fabrics to get a harmonic quilt at the end. Wow, the 1st row is already done! And now get up and pick your copy of the BOM-3 in the Stickbaer Shop. I wish you a nice Friday and of course a nice weekend. Sure you were waiting for this wishfully. 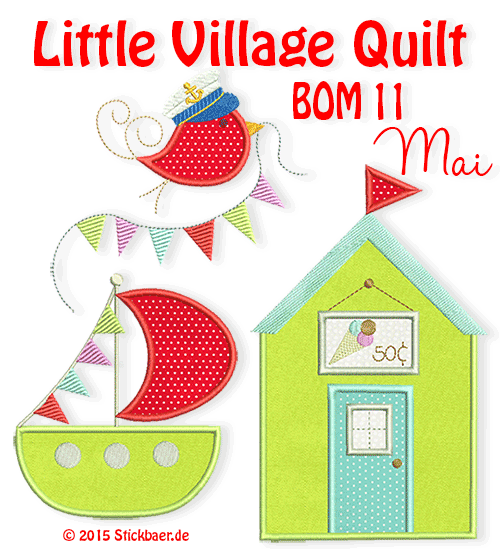 After starting with the first block of our Little Village Quilt Block of the Month some weeks ago time has come for the next, the second block. 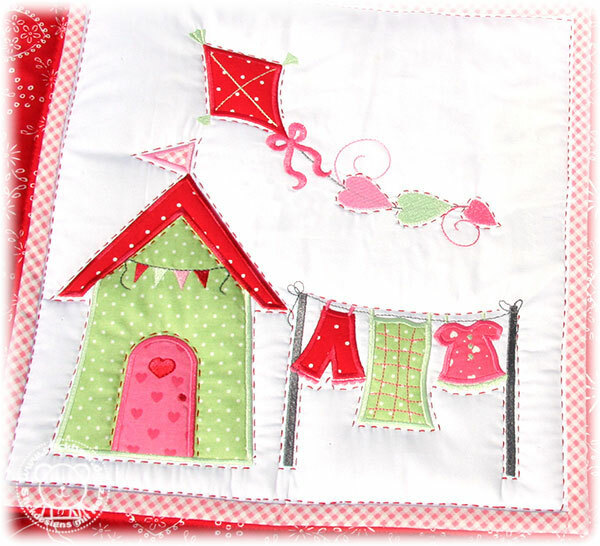 Since this is the August block and I promised that every block will suit the time of year, this block is a “fresh” block with a beach house, a dragon and clothing in the wind. August and sea for me definitely goes together since we are going to the sea during our summer holiday. 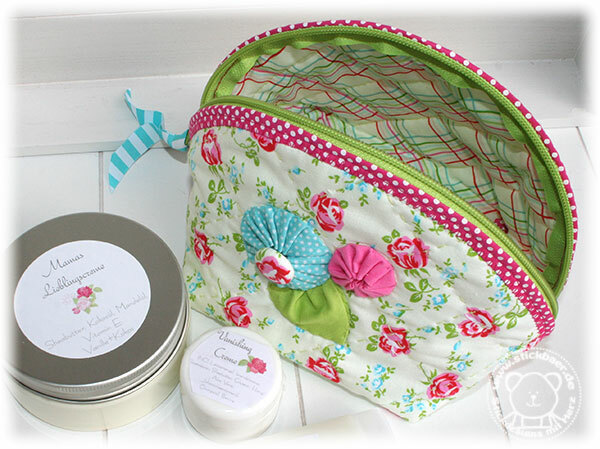 Every month I want to share some sewing tipps with you. 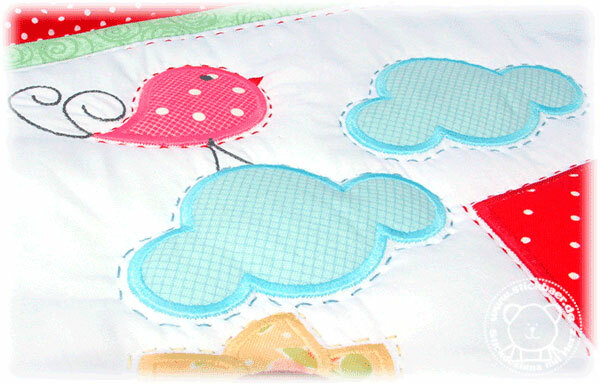 Some of you were asking how to best place the embroidery motifs. 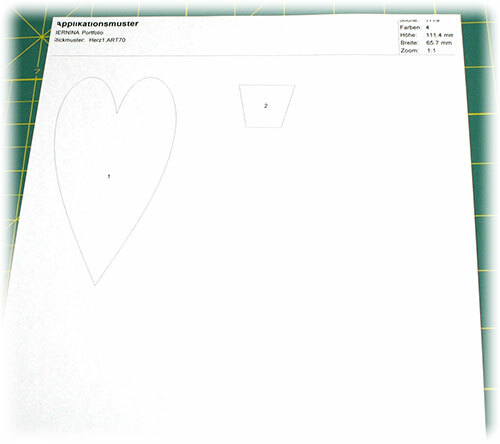 The best is to print out the pattern that comes in the ZIP package. There is a cross for the center point. Look at the picture below. 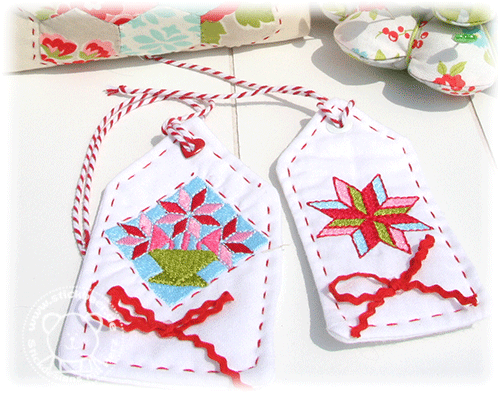 I have already 2 motifs embroidered. Now I am placing the pattern where I want to have the motif, fix it with tape (maybe) and then clamp the fabric to the hoop so that the center point of the pattern is the center point of the hoop. 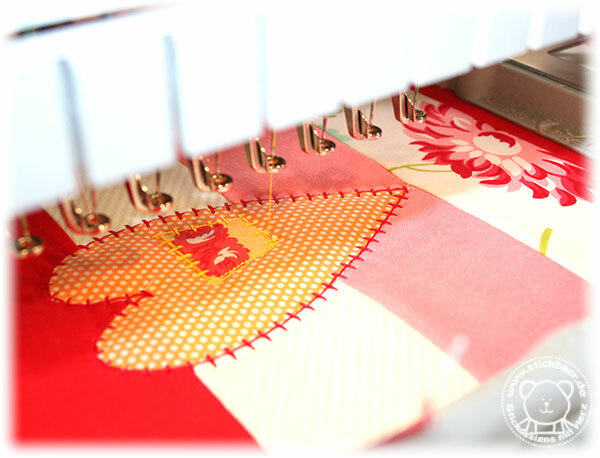 All embroidery motifs are centered in the file so your motif, here the dragon will be in the right place. Here you can see how to cut the sashing strip. Look at the 6cm marker at the ruler. The fabric has to be exactly aligned to this marker. 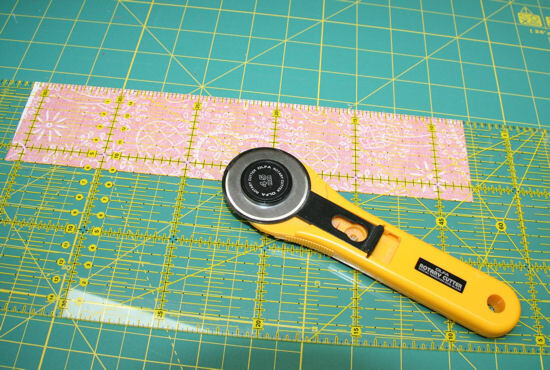 When then cutting on the upper edge of the ruler with the rotary cutter your strip will be exactly 6cm. 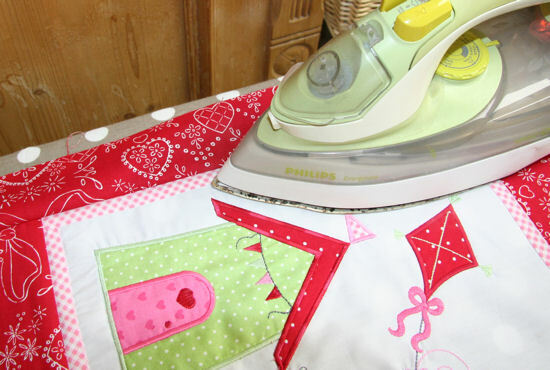 When you have sewed it on you have to iron it. First a short press on the seams to flatten the seam allowance. Now turn the strip and iron it. 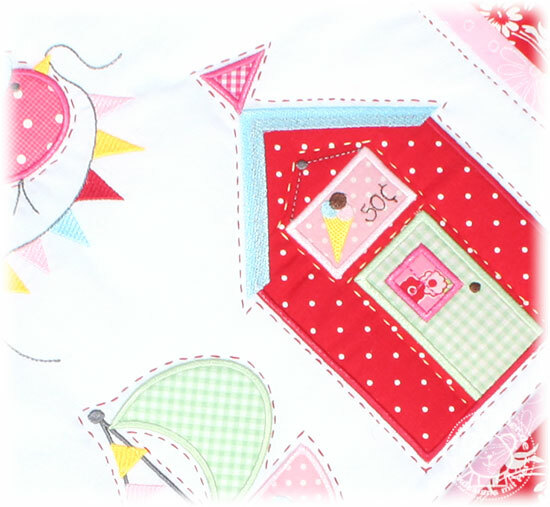 During this the allowances will be ironed to the darker side of fabric (where possible). 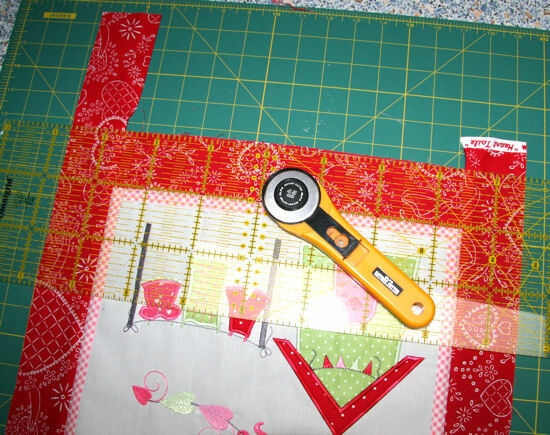 Cut the overlaying fabric. Use the ruler for orientation. All 4 sides have to have the same width. This one is “shooting” little plastic thread through all 3 layers. 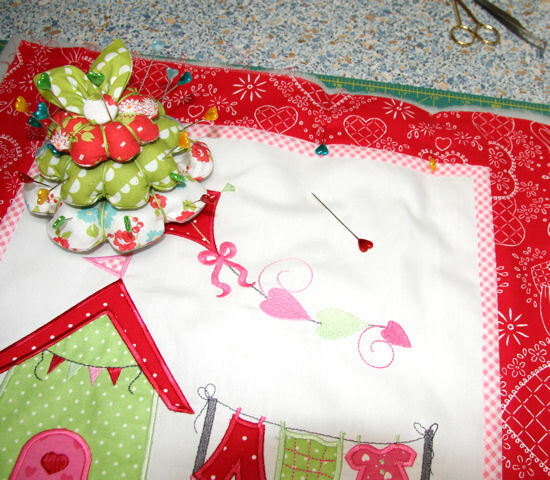 After the quilting you can remove the threads easily. 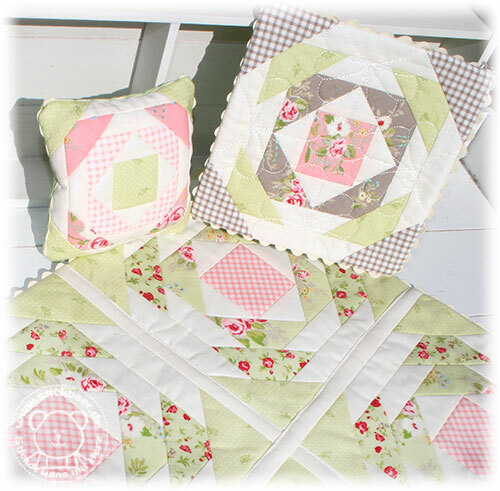 I surrounded each motif with small quilt stitches. And each clothing on the clothesline. Since my batting is really thick the stitches tighten the fabric. This effect will enhance after 1st washing. When you don’t like the effect use a batting of 0.5 or 1cm. The 2nd block is done. 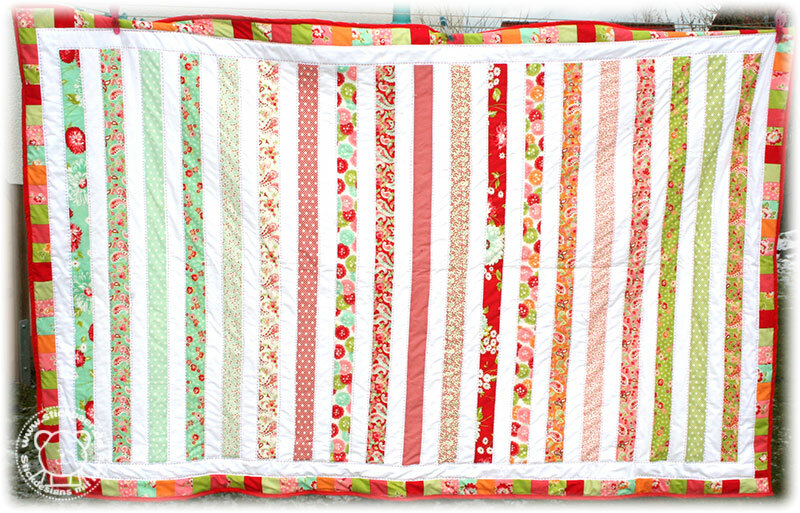 So my quilt grew a little bit..
And since we want you to grow your quilt from today you find the next block in our Stickbaer Shop. 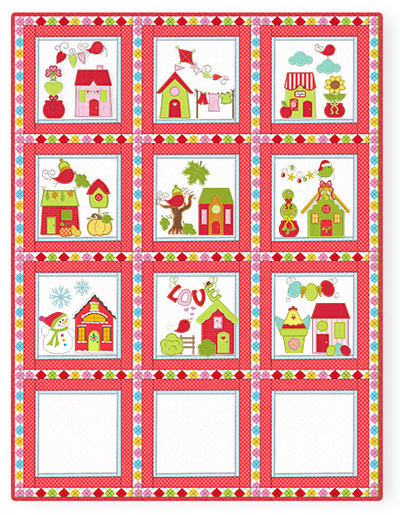 Our “Little Village Quilt” – Pinterest Gallery is filling up as well. 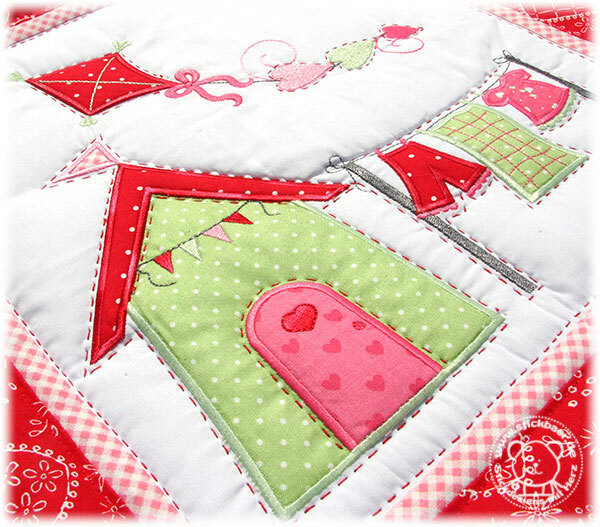 Please send in your pictures to share your project and to present your marvellous quilt blocks. I wish you all a great weekend and send Friday wishes. 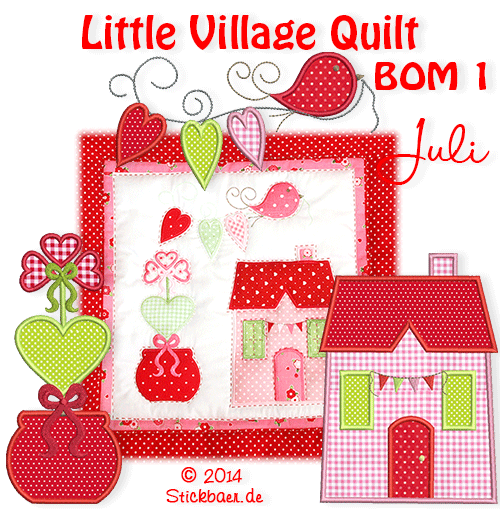 The new “Small Quilts” are realy small. That’s why I am calling them so. As said they are really small. The blocks you can see in the middle are 4cm or 6cm, means each block is contained twice. 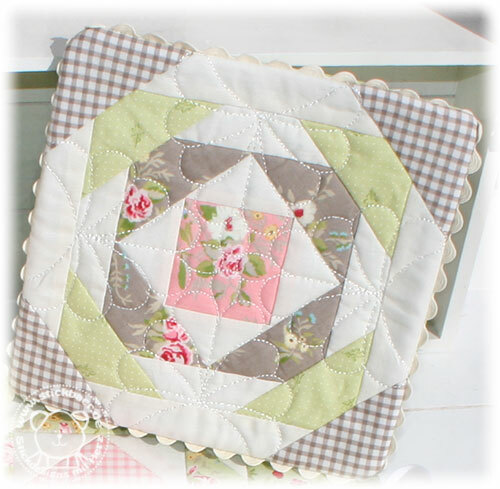 The quilt motifs as well are small, at least they fit the 10x10cm embroidery hoop. 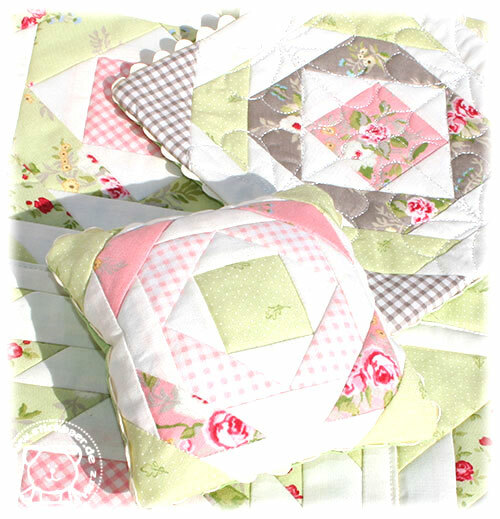 The blocks are made after the “real” classic blocks. 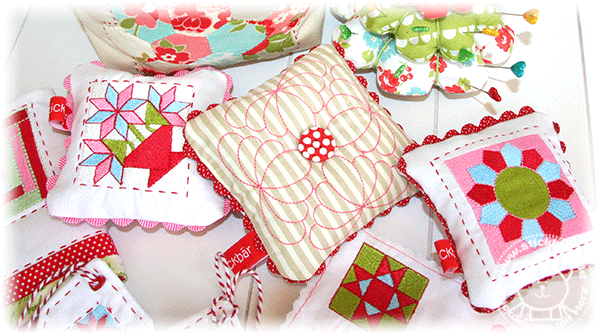 There is so many things you can embellish with these new motifs. 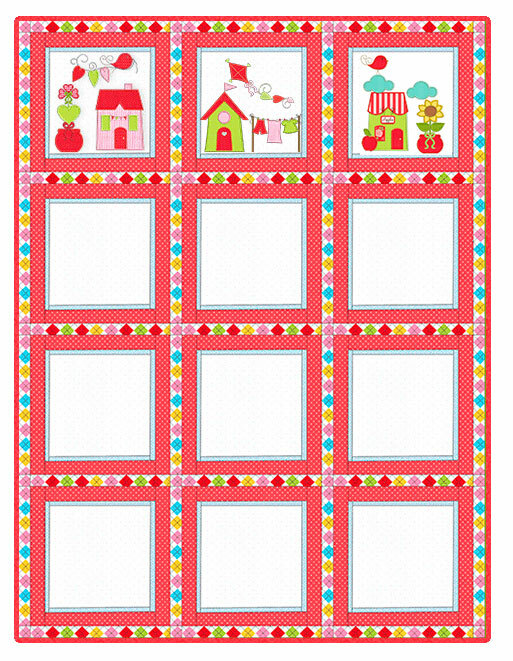 This one I added one of the quilting motifs. The knob in the middle squeezes it. Looks beautiful. For their birthday gifts I am preparing labels for my quilting friends. Are you feeling fancy to try this out? Still need some inspiration? Head over to our Testers Projects Page. Finally in Bavaria school holidays started this week and we are slowing down a little bit. 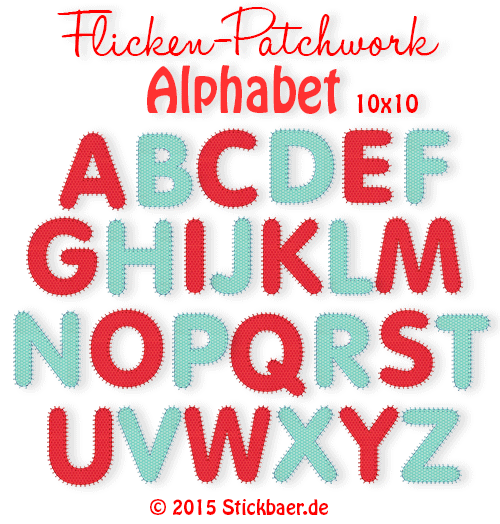 Nevertheless you can find the new file in the Stickbaer Shop. I am sending my Friday Regards. (“Hex, Hex” is the spell of Bibi Blocksberg, the loved by German kids little witch. “Hexe” = witch. 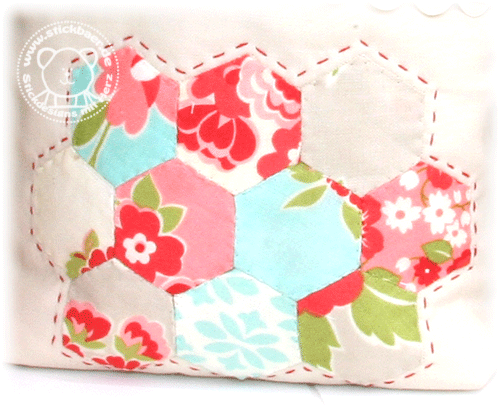 At the weekend I tryed a new to me patchworking technique: Hexies. 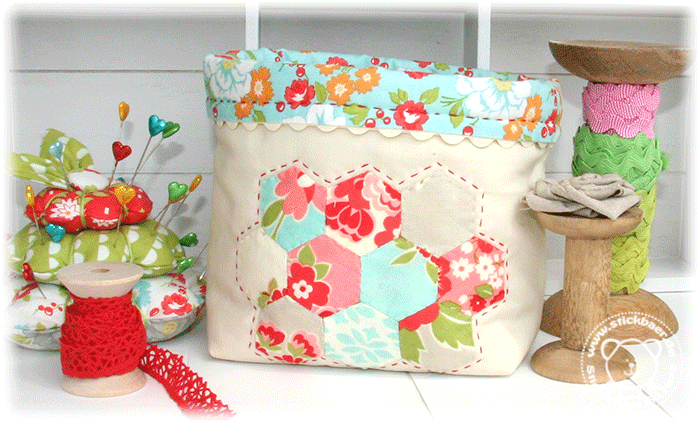 All you need is a lot of fabric hexagons, the same number of paper hexagons (a little bit smaller), needle and thread, no sewing machine… The best to sit in the garden, and not in the sewing room. 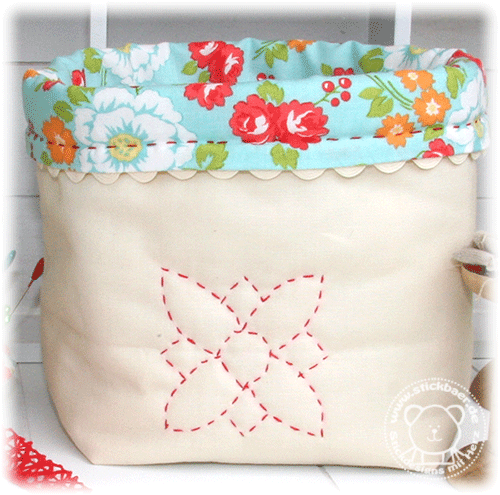 Turn the 2 sides to the back and fix them with running stitches. 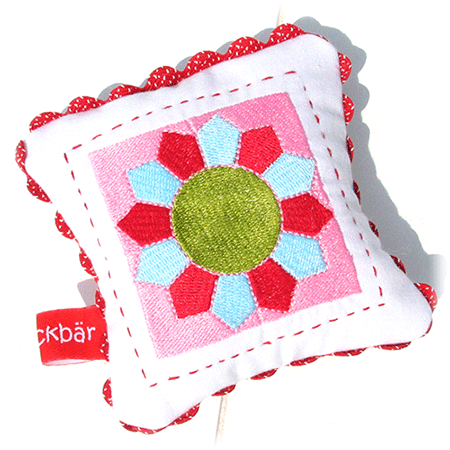 Next, sew one hexy to the other, using tiny stitches. 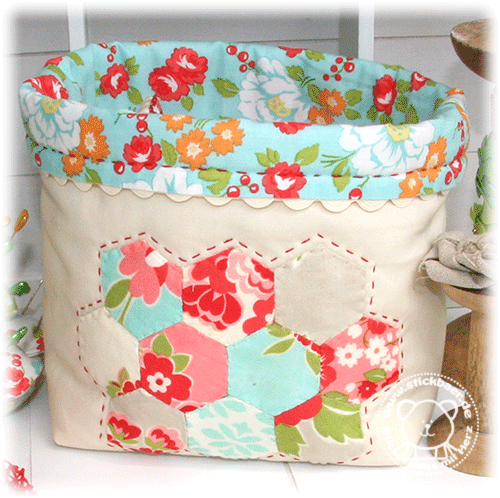 Here you see my very first Hexies sewed on a piece of fabric and later created a basket for little things. 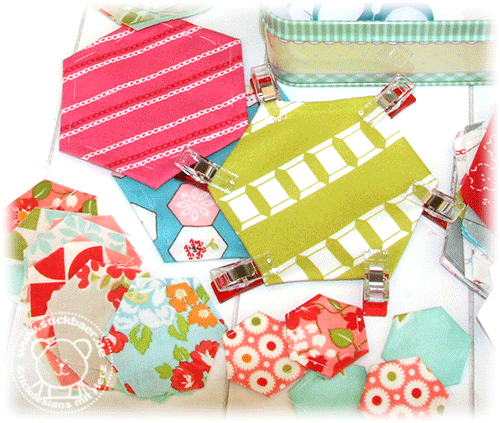 Each of the hexies is 2.5cm. Now I have an idea what to take with me to the beach. 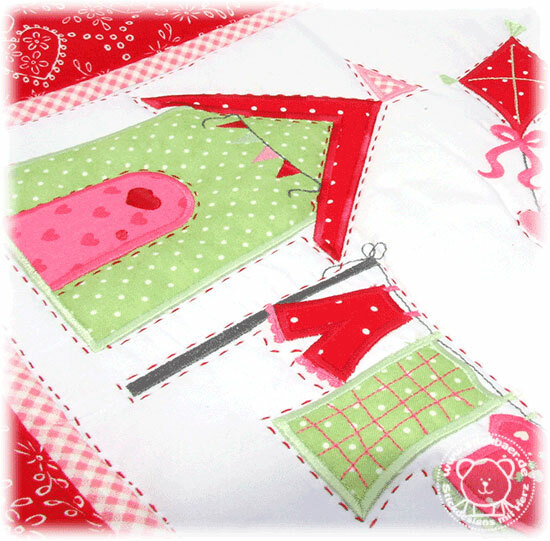 To prevent withdrawal symptoms when away from my sewing machine. All I need is fitting into this tin. Hey, is this an idea for your lazy holiday days too?